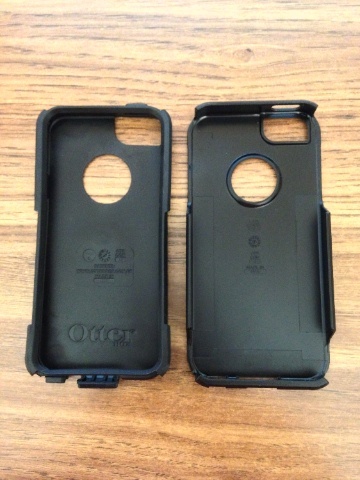 The OtterBox Commuter case for the iPhone 5 carries on a strong tradition of a first-class case in design and protection from the previous series for the 4/4S. There is an inner, soft silicone layer plus a sturdy outer polycarbonate layer. It comes with a screen protector and is available in two tone colors. This case was previously reviewed for the iPhone 4S and received a 4.5/5 rating. After a year of reliable use, I’m ready to raise that rating to 5/5. Only a little bit has changed in this version for the iPhone 5. Of course, it’s larger to accomodate the taller iPhone 5. Thanks to the smaller size of the Lightning port and connector, the flap that covers the port can be smaller. It’s also easier to pull that flap out because of how the speaker port and microphone port are positioned on each side. Because the iPhone 5 doesn’t have a microphone port next to the 3.5 mm audio jack, the flap, on the bottom, that covers the jack doesn’t have a hole it it. This is nice, and eliminates the potential for dust to enter that area. It certainly feels to me that OtterBox has improved how these flaps lock into place. On the iPhone 4S version, the flap that covers the 30-pin port seemed to lay loose and not secure so well in the closed position after a year. The aperture for the camera and flash is redesigned, more oblong and a tiny bit deeper. That would seem to afford a tad more protection, but it’s a small thing. 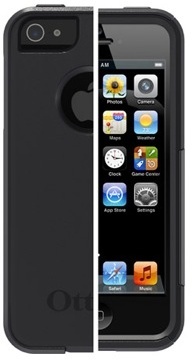 Like most cases of this design, the outer bezel protects the iPhone face when laid face down. Other than these details, nothing major has changed, and the Commuter for the iPhone 5 provides great protection for your iPhone 5, just as the previous version. Plus, it’s easy to remove by slipping the hard polycarbonate shell off first, starting from the top, and then the inner silicone layer last. As before the packaging is fairly is well made and easy to open. A protective screen is included, but I never use those because I can never do it perfectly, without bubbles or dirt. A small leaflet shows how to insert the iPhone in the case. For more details, refer to the first review published last November. Even though the case is larger, the price remains unchanged. I give it my highest recommendation. Dual layer design for shock absorption and outer bump protection, easy to install and remove, screen protector included, attractive two-tone colors, excellent fit and finish, won't pick up lint, protects face of iPhone when laid face down.